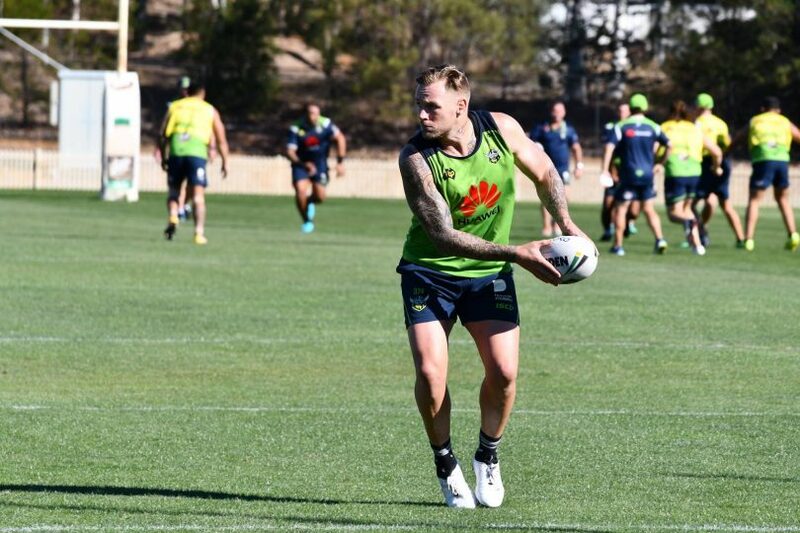 Did we see the best of Blake Austin at the Canberra Raiders? Blake Austin will head to the Super League at the end of the NRL season. Photo: Supplied by Canberra Raiders. The announcement by the Warrington Wolves that they have signed Canberra five-eighth Blake Austin to a three-year deal will no doubt be met with a certain amount of disappointment by Raiders’ fans. They are still are on a high from his 15 minute cameo off the bench on Saturday night to win the game for the Raiders against the Bulldogs. It was, by every measure, one of the best 15 minutes from a player in the NRL in recent years. The question most will be asking though is whether we saw the best of Austin during his almost three years at the Raiders. He was a player who could create something out of nothing one week only to seemingly drift in and out of a game the next week. He was a player who could bring down the biggest forward with a great defensive hit only to leak a couple the following week, as was the case against the Broncos, which resulted in him being replaced in the starting side by Sam Williams. To fully understand the psyche of Blake Austin it is worth casting an eye to his life away from football. He was a star from an early age. In fact, as a nine year old he won the Footy Show’s “In a League of their Own” segment which highlighted outstanding performances by junior football players. The prize was a Holden Jackaroo, which his parents sold to enable the family to move out of their Doonside Housing Commission home in the Western Suburbs of Sydney. The money was used to buy their home in Mount Druitt. When he made it into the NRL he went back to coach the Doonside under 16 team, a team known as the “Uncoachables” because of their poor discipline. Needless to say he took the team to the Grand Final in 2013. In 2016 he was driving to a game at Canberra Stadium when he noticed a Raiders’ fan in the freezing cold waiting at the bus stop, he turned around and ferried the no-doubt surprised supporter to the game. I have interviewed Blake on many occasions. I can’t say I know him well, but he is generous with his time. At times I get the impression he is out to prove a point on the field. The game against the Bulldogs is a case in point. No doubt stung by being relegated to the bench he appeared nonplussed at being the centre of attention after the game. In 2015 he was the Daly M five-eighth of the year such was his impact for the Raiders in his first season at the club. Now, less than two years after receiving that accolade, he is heading out. In his statement upon announcing that he was leaving the Raiders, Blake said he believed his best years of footy were ahead of him, he says it is not a cameo at the tail end of his career. With that comment ringing in the ears of many a Raiders’ fan, I suspect he is right. Judging by what we saw against the Bulldogs and the fact that he seems to perform at his best when he is out to prove a point, I think he is capable of more. As a marquee player at Warrington he will be under more scrutiny than ever was the case in Canberra and English supporters are not backward in criticising players if they turn in a poor performance. There is no doubt he will be missed. The hope is that he might return after a three-year stint in the U.K Super League as an even better player. The Raiders management needs to be refreshed. They have made two blunders this year one being making Blake Austin go and the other failing to give the player currently suspended closer supervision.